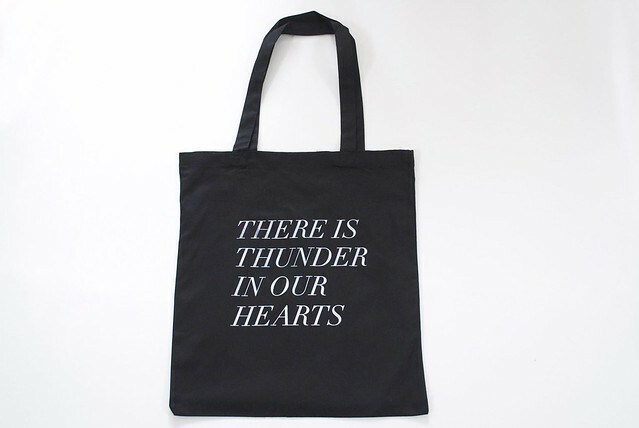 After a few requests, we decided to print the Thunder tote on black canvas with white lettering. We'll be adding them to the shop & Etsy momentarily. kater: I just love them! I ordered more today so that I won't have to worry when I finish these. I would hoard them if that were reasonable in any way. janis: My hair is very dark too so just be sure to brush it well! erica-knits: I love having plants around, although sadly baby's tears never seem to last very long in my care. They're so beautiful and delicate, though. jen: It was crazy, I just kept pulling them off the rack in a daze. I'm usually not that lucky either! And Geoff and I are still laughing over midnight snack bar. Ha! nice-etc.com / caitlin: I hate cleaning but I think that having a clean apartment has got to be one of my top ten favourite feelings. Especially when we can open the windows! Sierra: Oh wow, I can't believe I was the first! I feel as though so many others addressed it, and far better than I did. Thank you. m.bardeaux: I think you're probably right about that! Poor patchouli. in dreams: The tulips were from Whole Foods. And yeah, I feel you on that Imp. Project film! I always blame myself for messing it up, but maybe it's not me, haha. They'll get there, I hope. danielle and dinosaur toes: The tall one is aloe! I like having it around because it can come in handy for any little skin problems. Dry shampoo is the best, and I hope you got to go thrifting! Ringo, have a banana! : I know. I can't even look. I saw some pictures on the Daily Mail website today that were so, so unreal and horrible. Just wringing my hands over here, not sure what else to do. Diana: Yeah, I am a dry cleaner's worst nightmare! I pretty much only go to the cleaners once a year. avalonne hall: I agree. And thank you so much. We're lucky to get a good amount of light in this apartment! I love potted herbs myself because we use them for cooking all the time, and there's just something about growing them yourself. I just looked Boskke up, and wow! So amazing! Thank you for all your sweet comments. Jen: I always feel terrible for making other people want things, but at least they're pretty cool things? And I would love to be the OLO queen, but I think that title goes to Heather! EvaForeva: I only use the dry shampoo on my bangs, which can get rather oily, and my roots. I really like it! Hollie: I know, so delicate and pretty! Miss Cris: Oh wow, ha! Rose and old paper! That's interesting! I definitely did not spritz it! The tissue paper came from a shop that sells retail packaging and it was wrapped up until I packed the orders. I wonder what could have done that! Thank goodness it was a smell you liked (I'm paranoid about shipping things that smell like cooking and whatnot!). Thanks for ordering! Wasabi Honey Bee: Thank you for saying hello! Katie: I don't use it too often. I wash my hair maybe twice a week and use the hair powder when my bangs start to look a little oily. Maybe 2-3 times a week? sunkentreasure: Yes! So clean and perfect. oh how LOVELY! Black works great with the lettering. Love it! I agree with Camille--the black is very eye-catching! Ps. Happy to report that my Dream tote arrived safely last week. It's so pretty. I'll have to do a little photoshoot with it when I'm feeling less shy too! i love the white on black! white on black is the tops...hope you decide to share your jacket, it looks wonderful! Dark hearts! Love the new black version. Love the black version! Super cute. What a great idea to print it on black tote! I can't wait to see the coat! Anyway, I continue to adore feildguided! Thankyou! managed to snag one, happiest person now! Love these. If you restock the black bags let us know. I would love to purchase one. ohh i really like the white on black! 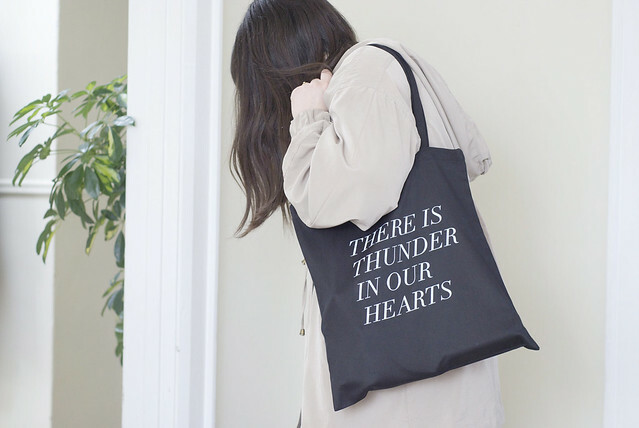 Oh I love this (I actually have a collection on flickr "There's a thunder in our hearts". Lol, random info). When I get a job (and then some monehmoneh), I'm gonna need this! thanks for making it, even if i didn't personally request it, hehe. some dude from munich practically accosted me on the streets today asking where i got my bag. i referred him to your blog name and told him to google. however, he kept saying "fieldpost" and i kept correcting him! i hope he gets it.